RODO (Made in Italy) Small evening handbag made of iridescent black leather and black rhinestones, representing a shell. It opens with a blackened metal hinge. Silvery leather lining, one open pocket. Circa 1980’s. Width 16 cm (6.25 in); Height without handle 14 cm (5.5 in); Depth 5 cm (2 in); Handle length 26 cm (10.25 in). Very good condition. 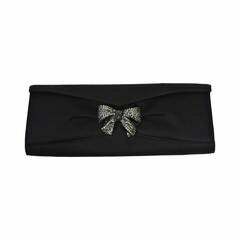 Perfect evening clutch by Rodo, rectangular in shape and featuring a marcasite rhinestone bow clasp. Interior has zippered compartment and metal chain to convert it to a shoulder bag. Rodo gold metal evening clutch, lined in gold leather. Converts into shoulder bag.